Success Story: The Davey Tree Expert Co. Discover a nationally owned tree care company that still lives up to its founders principles of knowledge, customer-focused service. And, learn about the family ties of Chicagoland’s operation. The Davey Tree Expert Co. is more than just professional tree care. Its well-trained employees also assist with a variety of lawn and garden care services. The Davey Tree Expert Co. knows the key to running a successful operation comes down to providing exceptional customer service. Bill Whitmire, vice president of operations for the national company’s residential/commercial services division, based in Wheeling, promises experienced and knowledgeable tree and lawn services. 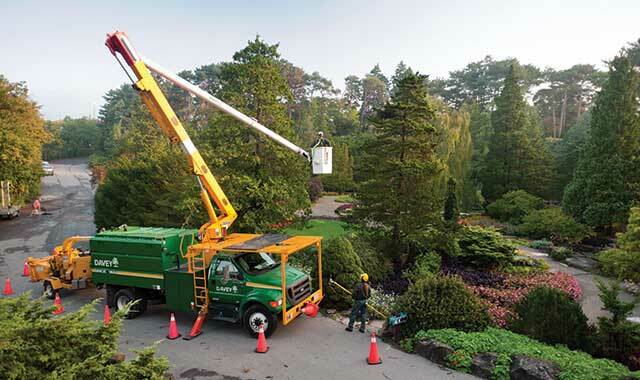 Davey Tree provides tree and lawn care services throughout the United States and Canada. Between Davey and its subsidiary, The Care of Trees, this Ohio-based company has 12 locations throughout the Chicago area, including an office in West Chicago, at 395 Industrial Dr. Its residential and commercial services include tree and lawn care, tree pruning and removal, plant health care, applications for disease and insect issues, and soil care applications. Davey Tree was founded in Kent, Ohio, in 1880, by John Davey, considered the father of the science of tree surgery. When Davey moved to Ohio from Somersetshire, England, in 1873, the U.S. was in a severe depression. But Davey’s skills with plants quickly became well-known, and he was never lacking for work. Soon, Davey became the town’s “tree man.” He started The Davey Tree Expert Company on the premise that trees could be saved and made to flourish, with proper attention. After he published The Tree Doctor in 1901, demand for John Davey’s tree care services continued to grow, expanding from Ohio into Pennsylvania, New York, Washington, D.C., and even Canadian cities such as Toronto and Ottawa. Davey’s son, Martin, became president of the company in 1906. Under Martin’s leadership, the company tended trees on highly visible properties, including New York’s Central Park. Davey also planted trees in Philadelphia to represent each of the 13 colonies during the U.S. Sesquicentennial, helping to further grow the business in popularity across the country. Today, Davey’s company is the 16th largest employee-owned business in the U.S., with more than 7,000 employees. Expertise in tree care has become more professional in the past 10 years, because companies are now certified through two organizations: the Tree Care Industry Association and the International Society of Arboriculture. Companies are held to higher standards of education, training and safety. Davey Tree stresses the importance of education, for both the customer and its employees, and its website provides a forum for users to ask questions of professional arborists. In addition, some Davey Tree employees are selected to attend a rigorous 30-day program, which further enhances their level of expertise. Expertise and education are especially important, because the average homeowner doesn’t always understand the difficulty his or her trees have in a suburban environment. Landscaping is important to any home, and can add 20 percent or more to the value of the property. How you care for trees today will have an impact on their condition years from now. One of the largest landscape issues to plague homeowners in the past 15 years is the emerald ash borer, a tiny green bug that arrived in North America in the 1990s. Detected in 2002, this invasive species has now spread to 14 states and parts of Canada. It has killed 50 to 100 million ash trees so far, and threatens to kill most of the 7.5 billion ash trees throughout North America. If you suspect your trees might be impacted, Whitmire recommends scheduling a visit with a certified arborist. He or she can evaluate the trees and give you protection options based on the age of the trees, the location and your budget. Whitmire’s mother and two aunts worked in the Davey corporate office dating back to 1935. Whitmire started in the Akron, Ohio, office about 35 years ago. Now, his son Collin is a field production manager for The Care of Trees in the Crystal Lake office, and has worked for the company for 10 years. This entry was posted on Friday, April 12th, 2013 at 11:59 am	and is filed under Northwest Business Magazine. You can follow any responses to this entry through the RSS 2.0 feed. Both comments and pings are currently closed.